There is a large body of empirical literature showing that marriage reduces criminal activity. However, many of these studies were done on the general population or used data that is now decades old. Very little research has examined whether relationship status impacts social outcomes, including desistance from crime and labor market participation, among a contemporary cohort of ex-prisoners. Using data collected from over 650 male former prisoners returning to three large U.S. cities between 2002 and 2005, we tested the short-term impact of marital and intimate partner status on recidivism, substance use and employment. After statistically adjusting for self-selection into marriage or into unmarried relationships, we found that former prisoners who were married or living as married had half the odds of self-reporting a new crime and/or drug use as did those in casual, unmarried relationships. Marriages effect on drug use was strongest for older ex-offenders (those over age 25), suggesting that committed relationships are more beneficial for those already in the process of aging out of crime. Moreover, higher quality partnerships were associated with lower odds of drug use. Former prisoners in casual, non-married relationships experienced outcomes similar to those with no intimate partner. Overall, the findings suggest that in-prison programs that strengthen the quality of partner relationships may improve recidivism and substance use outcomes after release. The impact of marriage on participation in crime has long been of interest to criminal justice researchers. A large body of empirical research documents a positive relationship between marriage and criminal desistance,[i] and some research shows that marriage has the same effect on substance use[ii]. Thus, programs designed to encourage or improve partner relationships may lead to more pro-social behavior for ex-prisoners. In particular, previous studies suggest that programs that strengthen familial relationships can help former prisoners successfully reintegrate into the community. However, since these findings are from studies with samples drawn largely from the general population, the effect of marriage and relationship status on crime for a contemporary sample of men exiting prison is less certain. For a variety of reasons, the positive relationship between marriage and criminal desistance may not hold or may hold less strongly for returning prisoners than for the general population. First, since marriage is posited to reduce participation in crime through pro-social peer influences, involvement of the spouse in criminal activity may negate any positive effect of marriage. Marriage may have no effect on criminal participation by the ex-prisoner or even increase its likelihood if sorting processes lead ex-prisoners to partner with someone also involved in criminal activity. Moreover, marriage may lead to pressure on returning prisoners to earn higher incomes after release, including illegal sources if their legitimate options are limited. While marriage may not generally have this effect for the general population, it may hold for ex-prisoners since incarceration reduces employment prospects and ex-prisoners have shown a willingness to break the law in the past. It is also possible that the relationship between marriage and crime observed in older literature no longer holds as social mores have evolved. Divorce rates are higher and marriage overall is less common today than in the 1950s. For example, while 70 percent of black families were headed by a married couple in the 1960s, this percentage had decreased to 48 percent by 2002. These changes in family structure along with high recidivism rates among former adult prisoners suggest that study of marriages impact on re-offending and other social outcomes among ex-prisoners is warranted. Data collected from the Returning Home study of male prisoners returning to Chicago, Illinois, Cleveland, Ohio, and Houston, Texas, provided a unique opportunity to examine the effects of relationship status on reentry outcomes (see data section at end of brief). The longitudinal Returning Home study employed three waves of interviews to follow a group of 652 men, whose relationship status ranged from single to unmarried cohabitation to married or like-married relationship. Do former prisoners in married or like-married relationships fare better than those in more casual relationships or no relationship with regard to finding employment and desisting from crime and substance use? Do former prisoners in casual relationships fare better than those who are single in finding employment and desisting from crime and substance use? Among ex-prisoners in a relationship, does the quality of that relationship influence post-release reentry outcomes? Does marital and relationship status have different effects for older versus younger former prisoners? Using survey responses to three questions related to relationship status prior to and shortly after release from prison, we classified each returning prisoner in the sample as belonging to one of five relationship statuses: (1) married/living as married, (2) separated from marital partner, (3) single, (4) domestic partner, or (5) dating/being in a casual relationship (see insert below). These subgroups were formed based on respondents indication as to whether they were married or living as married prior to incarceration and whether they had a partner and were living with that individual immediately after release. In order to compare married/like-married, casual relationships and no relationship, these five subgroups were further collapsed into two groups. The first subgroup (partnered) consisted of respondents who indicated that they were in a relationship, married or otherwise. Within this group, we compared individuals who were married/living as married to those who were not. The second subgroup (unmarried) consisted of respondents who indicated that they were not married. Within this subgroup, we compared individuals who were in a relationship to those who were single. By collapsing respondents into these two subgroups, we were able to isolate the incremental impact of progressively stronger relationships on outcomes the incremental impact of marriage compared to more casual relationships and the incremental impact of casual relationships when compared to being single. Living as Married: Respondents who reported being or living as married before prison and as living with a partner immediately after release (n=74) were considered to be living as married, regardless of legal marital status. Separated: Respondents who reported being or living as married before prison but reported no partner or that they were not living with a partner immediately after release (n=57) were considered to be separated from their partner. Single and Unattached: Respondents who reported that they were not married or living as married before prison and that they had no partner immediately after release (n=304) were considered to be single and unattached. Domestic Relationship: Respondents who reported that they were not married or living as married before prison but that they were living with a partner immediately after release (n=74) were classified as being in a domestic relationship (a domestic relationship that falls short of living as married). Casual Relationship: Respondents who reported that they were not married or living as married before prison but had a partner with whom they were not living immediately after release (n=143) were considered to be in a casual relationship. Information about marital status, partner relationships, and cohabitation was asked differently on interviews conducted before and after respondents' incarceration. Thus, we created five definitions of relationship status relying on responses from both waves. Any study investigating the effect of marriage of behavior must take into account innate differences between people who choose to enter into married or casual relationships. Theory suggests that some positive outcomes which seem to be the result of marriage may instead be due to self-selection into marriage by less criminally-inclined individuals. [iii] Since we cannot randomly assign individuals into married or unmarried relationships to isolate the causal effect of marriage on outcomes, we used statistical methods to separate causal from self-selection effects. Accordingly, we used a technique known as propensity score analysis to ensure that each group of former prisoners (married versus unmarried in the partnered subgroup and partnered versus unpartnered in the unmarried subgroup) was similar across a large number of attributes theoretically related to both relationship status and the outcomes analyzed. Propensity score analysis creates comparability between the groups by giving higher weights to those individuals in each group who look most alike, and less weight to those who look most different. Thus, in the partnered analysis, married individuals who have similar attributes to unmarried individuals were weighted more heavily than married individuals who look nothing like unmarried individuals. This process was repeated for each analysis. We tested the impact of marital and relationship status on seven outcomes measured post-release. These outcomes span three domains criminal offending, substance use and employment. Figure 1 shows the average scores among all respondents across these seven measures. The first criminal offending measure, reincarceration, was a binary variable indicating whether or not a respondent was reincarcerated within 8 months of release (using data compiled from correctional department records in Illinois, Ohio and Texas). Overall, 13 percent of the sample was reincarcerated. Self-report data collected eight months after release was used for the other six outcomes. In the criminal justice domain, we observed whether or not the respondent reported committed a new offense and the number of times the respondent reported having been rearrested. Seventeen percent of the sample reported at least one new offense with an average of 0.29 arrests overall. The maximum number of arrests was fifteen. Two binary measures of substance use indicated whether a respondent reported any illegal drug use or alcohol intoxication in the past 30 days (27 percent) or any illegal drug use, excluding alcohol, in the past thirty days (18 percent). The two measures of employment status indicated whether a respondent self-reported employment in the legal sector (46 percent) and the percentage of months a respondent was employed in a legal job since release (an average of 39 percent of the eight-month post-release period). We used regression analysis to test the effect of relationship status on these outcomes, controlling for other influences. First, we test the impact of being married/living as married conditional upon being in a relationship. Next, we test the impact of being in a relationship conditional upon being unmarried. For the partnered subgroup analyses, the main predictor was whether or not a respondent was married/living as married ( 28% percent were). For the unmarried subgroup analyses, the main predictor was whether or not a respondent was in a relationship (42% percent were). We also examined the impact of partner relationship quality on outcomes using a 13-item scale relating to the strength of the respondents bond with his partner. The partnership quality scale measured the closeness of respondents relationships with their partners (e.g., could turn to partner for advice, partner plays positive role in respondents life, would miss partner if separated). The scale ranged from 1=strongly disagree to 4=strongly agree and had a Cronbachs alpha reliability of 0.8 at both post-release interviews (our analysis uses responses from the first interview conducted immediately after release). In addition, we included a number of control variables in all models that were theoretically relevant and available in the Returning Home data. These variables are identified in Table 1. Analysis results are presented in two parts: (1) the effect of relationship status within the partnered and the unmarried subgroups (analyzed separately), and (2) the effect of relationship quality within the same two subgroups. In the partnered subgroup, we compared married to unmarried respondents. In the unmarried subgroup, we compared respondents in a relationship to those who were single. In the partnered subgroup analysis, being married or living as married was associated with a 12 percent decrease in committing a new crime (p<0.05) and a 2 percent decrease in illegal drug use or intoxication (p<0.10) relative to the unmarried group. In the analyses predicting reincarceration and employment outcomes, being or living as married had no significant effects. In the unmarried subgroup analysis, there were no significant differences between having a partner and being unattached across all outcomes tested, indicating that former prisoners in casual relationships experienced outcomes similar to those who were single. To explore whether the effect of marital and relationship status varied across different types of ex-prisoners, we added two interactions to our model between the key predictors and the control variables identified previously. Two significant interactions emerged. First, within the partnered subgroup, being or living as married decreased the prevalence of drug use or intoxication significantly more for respondents who were 26 or older than it did for younger respondents. Second, within the unmarried subgroup, having a partner decreased the likelihood of illegal drug use or intoxication only among respondents with no young children; partnership had the opposite effect among respondents with children under age 18. Lastly, we addressed the question of whether the quality of partner relationships had an impact on outcomes. This analysis was based only on the partnered subgroup. We found that for each standard deviation increase in partnership quality, the probability of any illegal drug use or intoxication decreased by 16 percent (p<0.05) and the probability of drug use alone declined by 9 percent (p<0.10). In addition, the probability of employment 8 months after prison declined by 18 percent (p<0.10); perhaps indicating that respondents spent more time with their partners than they did looking for a job. Partnership quality did not impact any measure of criminal offending. Importantly, even after adding partnership quality to all analyses in the partnered subgroup, the effect of being or living as married on outcomes remained unchanged, indicating that marriages effect on desistance from crime and substance use was independent of the quality of ones relationship. This analysis assessed the degree to which marital and relationship status has a causal impact on social outcomes among male former prisoners returning to the community. The results indicate that former prisoners living in married or like-married relationships had lower odds of self-reported recidivism and self-reported illegal drug use or intoxication than those in more casual relationships. However, former prisoners living in casual unmarried relationships experienced social outcomes similar to those who were single. In both analyses, we do not observe any differences across other outcomes. For former prisoners in a partnered relationship, marriage decreased substance use only for those over 26 and not for younger ex-prisoners. These findings suggest that when individuals are already in the midst of potentially aging out of crime, living in a married or like-married relationship can be an important source of support upon release from prison. Participation in a more casual relationship may not provide the same pro-social support. In contrast, when individuals are closer to the peak ages for criminal behavior (in this case, younger than 26), marriage had no discernable effect. Several hypotheses are consistent with these results. First, spouses of older ex-prisoners may feel more invested in their incarcerated husband than those of younger ex-prisoners or may have fewer alternatives. Consequently, such spouses may have greater incentive to invest in their husbands pro-social return from prison. Second, younger ex-prisoners are more likely to have younger spouses, who by virtue of their age are also more likely to engage in criminal activity. Thus, it is less likely that young spouses will have a pro-social influence on the returning prisoner. Lastly, there is a possibility that younger respondents have a more fluid definition of a like-married relationship than older respondents. If these relationship bonds are not as strong as for older respondents than the finding of no differences in outcomes is consistent with the finding of differences in outcomes between those in casual relationships and those who are single. We found that the quality of partner relationships was associated with lower odds of substance use. Furthermore, we verified that partnership quality retained its significance after the inclusion of marriage as a control (and vice versa). This suggested that partnership quality was important, not only for married relationships, but for relationships more generally. Our analysis additionally suggests that both marriage and quality have separate, significant effects on these outcomes. Given the short time-frame of our study, these findings are especially strong. Laub, Nagin, and Sampson (1998) found the advantageous effects of marital quality to be gradual and cumulative over time; the fact that our results are measured just eight months after release from prison underscores the significance of relationship quality and marriage. Lastly, we note that the inclusion of weights to account for self-selection into marriage led to only small changes in our models parameters, a finding that contradicts literature suggesting that more pro-social individuals self-select into pro-social institutions such as marriage or partnerships. One possible explanation is that selection into marriage or a relationship functions differently among former prisoners than among those in the general population. Perceptions of marriage may differ between the former prisoners and the general population, leaving open the possibility that marriage may not be as strongly related to pro-social tendencies. While further research on this topic is needed to better understand the nature of selection among former prisoners, this finding raises interesting questions as to differences in selection into modern day marriage and into marriage that previous studies have modeled using data from prior decades. As the research on marriage amongst returning prisoners remains in its infancy, there is a great deal of need for future work on this topic. In particular, future work might focus on four areas, each of which would enhance our understanding beyond what has been presented in the present study. First, future research would add to public knowledge by following ex-offenders for a period of time longer than 8 months. Since social outcomes may exhibit considerable temporal variation following release from prison, with outcomes measured 8 months after release from prison, it may be the case that we are only able to observe changes in outcome variables that are directly manipulated by an ex-offender and, as such, are subject to immediate change. For example, while an offender can choose not to use illegal drugs, successful employment depends not only on a pro-social attitude but also on labor market conditions and his possession of marketable skills. Likewise, outcomes that are observed at 8 months of followup may subsequently erode leaving open the possibility that future studies following former prisoners for a longer period of time may fail to confirm the results of this study. Second, future research would benefit from a larger sample of ex-offenders than the one used in this study. While this study identified several key outcomes that are associated with marital or relationship status, many other outcomes were not statistically significant at conventional levels. It is possible that some of these effects could have been significant in a study relying on a larger number of observations. Third, the present study should be replicated using additional samples with additional data to ensure that the present study is externally valid and broadly applicable to a nationally-representative sample of returning offenders. In all future studies, it is critically important that researchers employ measures to account for self-selection into marriage and/or partnership in order to rule out the possibility that an observed association between relationship status and outcomes is not spuriously determined. Consequently, future research that can better predict marriage, by obtaining variables related to an individuals childhood, parents, and expectations for marriage and family, can most convincingly demonstrate the effect of marriage. Lastly, the current study raises questions of the effect of other sources of social support. The potential of non-marital cohabitation to affect beneficial social outcomes should be explored further. While we show marriage to have a positive effect vis-à-vis casual relationships, it is yet undetermined whether it has an effect vis-à-vis cohabitation. Current findings suggest that marriage may be a strong pro-social form of support; however, there remain substantial questions around the mechanisms by which it operates. Further research should test these findings and explore these mechanisms to better understand how relationships and institutions such as marriage affect changes in offending. Data used in the present study came from three waves of interviews with 1,500 male offenders conducted between 2002 and 2005 as part of the Urban Institutes multi-state study Returning Home: Understanding the Challenges of Prisoner Reentry. Surveys were administered just prior to release from incarceration (within 30 days), and interviews were conducted shortly after release from prison and again, eight months after release. On the in-prison survey, respondents were asked to provide information on their marital status as well as their criminal history, employment history, prior substance use, family stability and support, spirituality and other theoretically important attitudinal predictors of future offending. In the first post-release interview, respondents indicated whether or not they currently had a partner and whether or not they lived with that partner. In last post-release interview, respondents were asked to self-report employment outcomes, involvement in criminal activity, and substance use. The present analysis used data from the 652 men who responded to all survey/interview waves and provided complete responses to all relevant questions aforementioned. To account for potential bias introduced by missing data, sampling weights were constructed and used to re-weight the final analytic sample to resemble the initial sample of 1,500 offenders. Respondents who were separated from their marital partner were excluded from analyses, because although no longer married, they may have still received the potential benefits of marriage. A simple comparison between married and unattached individuals does not isolate the impact of marriage, because any differences observed may be due to marriage or to the mere presence of an intimate partner. [i] See Farrington, David, and D West. 1995. Effects of marriage, separation, and children on offending by adult males. Current Perspectives on Aging and the Life Cycle 4:249-81; Irwin, J. 1970. The Felon. Englewood Cliffs, NJ: Prentice Hall; Sampson, Robert, and John Laub. 1993. Crime in the Making: Pathways and Turning Points Through the Life Course. Cambridge, MA: Harvard University Press; Warr. M. 1998. Life-course transitions and desistance from crime. Criminology 36: 183-216. [ii] Duncan, GJ, Wilkerson, B, and P England. 2003. Cleaning up their act: The impacts of marriage and cohabitation on licit and illicit drug use. Unpublished paper. Evanston, IL: Northwestern University. [iii] Gottsfredson, Michael, and Travis Hirschi. 1995. Control theory and the life-course perspective. Studies on Crime and Crime Prevention 4:131-42. 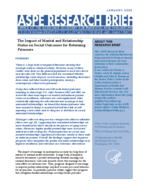 This ASPE Research Brief examines the relationship between being married or living as married and social outcomes for men returning to their communities from prison. It was written by Christy A. Visher, Carly R. Knight, Aaron Chalfin and John K. Roman at the Justice Policy Center of the Urban Institute under a Department of Health and Human Services contract with Educational Services, Inc. For more information about this study contact the authors (paffairs@ui.urban.org; Visher@udel.edu) or the ASPE project officer, Linda Mellgren (Linda.Mellgren@hhs.gov).